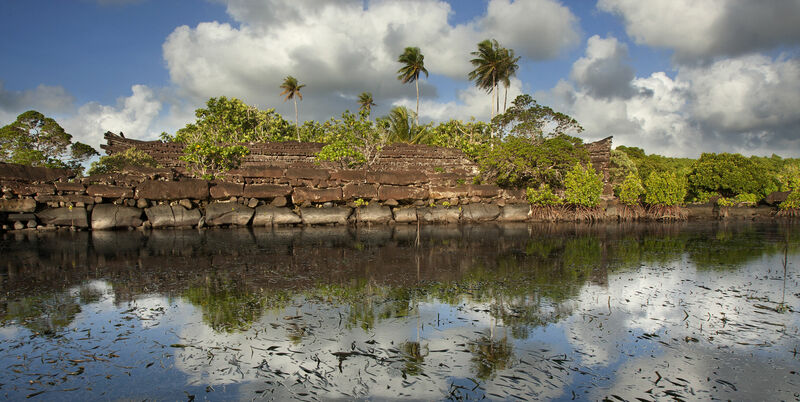 Pohnpei, FSM—As United Airlines’ “island hopper” flies, the mystical site of Nan Madol is only two hops away from Guam on the Micronesian island of Pohnpei. Situated on the densely forested island’s southern coast of, Temwen (pronounced chum-one) in the municipality of Madolenihmw, Nan Madol consists of 92 manmade islets constructed from huge basaltic rock columns – the largest of which weighs approximately 60 tons. A recent geological study found that more than 40 percent of the hexagonal basalt columns at Nan Dowas, the main ceremonial center of Nan Madol, were inexplicably moved from Sokehs on the other side of the island to the ancient city by means which no one has yet been able to convincingly explain.